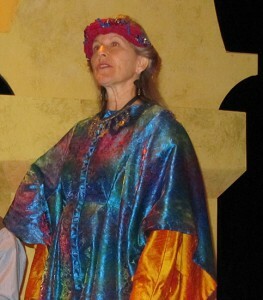 Susan Gaeta in her costume of many colors. Photo by Elizabeth Fulford Miller. Susan Gaeta is the vocalist/guitarist in Trio Sefardi, one of the two specialist music groups performing in this year’s Christmas Revels. 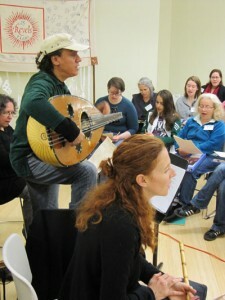 Susan is an important member of a new generation of musicians who are exploring the rich and varied traditions of Sephardic music. Originally from Connecticut, where her grandfather played clarinet in a Klezmer band and acted in Yiddish theater productions, Susan lived in Buenos Aires, Argentina, for eight years, where she performed classic jazz and traditional Argentine folk songs. After moving back to the United States, Susan continued her explorations in jazz, and has toured extensively with legendary Sephardic singer Flory Jagoda, a National Heritage Fellow. 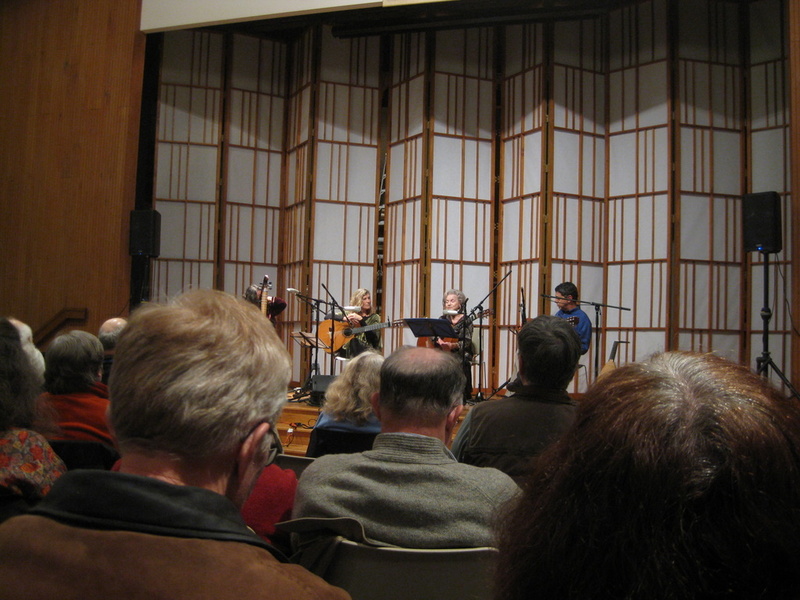 She also sang with Colors of the Flame, a trio of musicians dedicated to preserving Sephardic songs. In 2002, Susan was selected to participate in The Virginia Foundation for the Humanities “Master-Apprentice” program. Her recording, From Her Nona’s Drawer, includes Susan’s interpretations of a dozen songs from the repertoire of Flory Jagoda. In this year’s Christmas Revels, Susan will not only sing Sephardic music, but she will also be featured in several Spanish pieces, including the song that the Sevillanas is danced to, Algo se muere en el alma, cuando un amigo se va (or, “El adios”). Learn more about Susan Gaeta by visitng her Web site. 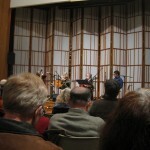 Tonight at 7:30pm, Trio Sefardi will be presenting a special concert at Cedar Lane Unitarian Universalist Church. This will be Washington Revels’ second “salon-concert” presented in conjunction with the 2011 Christmas Revels show–offering a great opportunity to hear and interact with our guest musicians in a more intimate setting than Lisner Auditorium. Tickets are available online or at the door tonight. 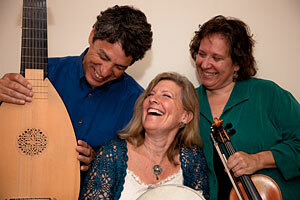 Performers Howard Bass, Tina Chancey and Susan Gaeta share a love of and a wide-ranging experience with Sephardic music. Its members have performed and recorded with La Rondinella, the Western Wind, and with NEA National Heritage Fellowship awardee Flory Jagoda, the renowned Sephardic singer and composer, who will be joining them tonight in this very special performance. 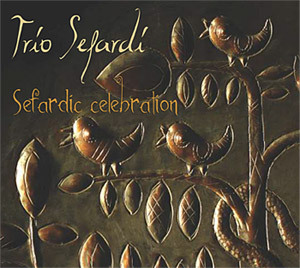 Trio Sefardi combines a respect for tradition with a creative approach to arranging and scoring to bring the vibrant past into the living present. After making their Washington-area debut on the Kennedy Center’s Millennium Stage in November 2010, the trio is now releasing their first recording, Sefardic Celebration this month! In fact, if you attend tonight’s salon-concert, you will have an opportunity to purchase one of the first copies of this new CD (Hear audio excerpts from their new CD online). Music of the Sephardic Jews, including traditional songs encompass ballads, romances and wedding songs that were passed on orally and sung originally in various Iberian languages (Castilian, Catalan, Galician, etc. ), as well as Hebrew. Who are the Sephardim (Sephardic Jews)? Those Jews whose roots can be traced to the Iberian Peninsula where Jews first appeared in the early years following the Roman destruction of the Second Temple in Jerusalem, and exile from the Holy Land. There are references to a Jewish presence in Iberia from the time of Solomon, when Jewish adventurers sailed the Mediterranean Sea. The first notated date is 79 AD. Spanish Jews in Iberia lived in relatively good times under Moorish rule during the 10th and 11th centuries when Islamic power was at its zenith. Jewish physicians, advisors, diplomats and financiers were important participants in the Islamic Courts in Spain. They were classed as politically neutral and used as arbitrators in all disputes between Muslims and Christians.